Quick tips for putting on a school Christmas Fair fundraiser at the last minute, and with minimum stress. If you’re like me, you spend each school term rushing from one task to the next. Christmas in a school feels like one long hectic rush towards the big day, when you collapse on the sofa with a glass of festive fizz and wonder where the time went. And yet in the run up to the end of term, you don’t want to miss an opportunity to raise much needed money for the school. And that means a Christmas Fair. Some schools have the luxury of a fully-fledged PTA, with Christmas Fairs planned to perfection at least a year ago. But if that’s not you, don’t despair. There’s still time to put together a Christmas fundraiser to be proud of. Use our list of quick tips to give a festive boost to your school fundraising with a Christmas Fair that won’t leave you more stressed than Santa’s head elf on Christmas Eve! Option 1: Short on time, short on resource. If you have limited bodies to call on for help, keep it super simple, with an after school invite to a family Christmas social. Set aside an afternoon just before the end of term to show a Christmas movie to the kids. Have a couple of teachers or parents to supervise, then keep the children busy while you serve festive drinks to their parents. Make a huge pan of mulled wine, or pop some corks, and sell festive spirit to the adults along with a mince pie. (Check out our guidelines to alcohol licensing here). You could even eke things out till teatime and sell sandwiches and crisps to give mum and dad one less thing to think about when the kids home! If your school loves a bake sale, why not ask families to bring in cakes to sell. A non-uniform day always goes down well with the kids, so have a Christmas dress-up in return for a donation of cakes or £1. Set aside one room for children, and ask a few teachers if they’ll stay behind for an hour or so to supervise. Buy in some festive craft materials and let the kids get busy with the glitter while parents are busy raising money! 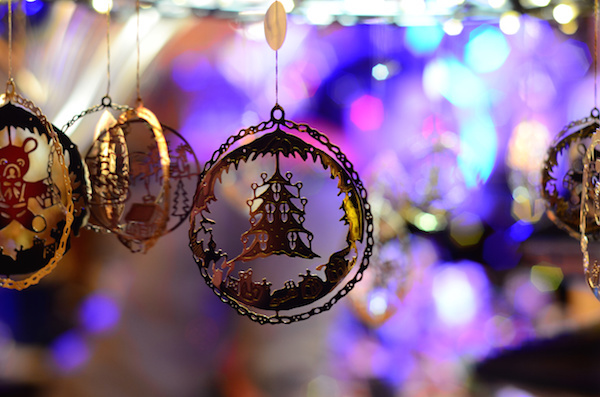 Invite local artisan businesses to set up a table in your hall to sell Christmas gifts; cards and wrapping paper, tree decorations, and Christmas preserves all do well at a Christmas fair. Charge businesses to attend, or ask for a percentage of their sales as a donation. Start with one or two businesses if a bigger sale feels too much this year. You can use the experience to mount a larger event next year, when you have more planning time. Ask local businesses if they can donate a raffle prize. A raffle is easy to put together and operate, and you can sell tickets on the door for a quick extra boost to the fundraising pot. If you know you can get a crowd in, but just don’t have the hands on deck to run a big Christmas Fair, you could even buy in the operation. We love the look of Crafty Fox Market, who will fill your venue with artisan sellers, for a fee. Can the children make something in school to sell, ahead of the Christmas Fair? Parents find their children’s creations irresistible, so have a look for easy Christmas crafts that will sell well. Candles are simple but pretty, and salt dough tree decorations are simple to make with children. Anything you’re selling can be turned into a gift with some pretty wrapping and labels. Offer to gift-wrap in return for a donation, or sell hand made labels for gifting. Run a gifts for parents room – only children are allowed! Buy a bulk load of small gifts that children can choose from in return for a donation. Children love to have a secret surprise to hide away for Mum or Dad on Christmas Day. A lucky dip stall is easy to run and quick to set up. Use the power of an offer – one dip for 50p, 3 for £1. If you have local craft sellers, see if they will offer a promotional online code for subsequent purchases that includes a donation to the school. Or try using referral codes: for example, for every friend they refer using the code, who makes a purchase, they’ll receive a £1 discount off their next shop. Sell themed snacks, or food gifts like this reindeer hot chocolate package. Set up a Christmas scene for a photo shoot with the kids. Pin the nose on the reindeer. Get the kids to make an igloo with empty plastic milk cartons. Ask people to guess how many there are in the igloo. Candy cane fishing game – pick up candy canes with a rod. If you can! Sell build your own snowman kits. Craft corner for kids – 50p to make a snowflake. Santa hat toss – throw a hat over a target to win a lolly.